Juicys™, purveyor of county fair favorites like the famous Kawabunga Corn Dog, Turkey Legs, Giant Western Sausages and the Funnel Cake Sundae, got its start in 1984 as a singleperson. Today, attendees at major fairs and festivals around the US and Canada flock to Juicys customized trailers to sample the fare from the mobile restaurant’s constantly expanding menu. Whether it’s the Houston Rodeo or the Los Angeles County Fair, hungry fair and event-goers know where to find the best curly fries, funnel cakes and ice cream treats. In nearly three decades, Juicys has grown from a humble corn dog stand into a massively popular outdoor dining and special event food concessions vendor. The company is frequently on the road with its Outlaw Grill, the world’s largest mobile grill trailer. 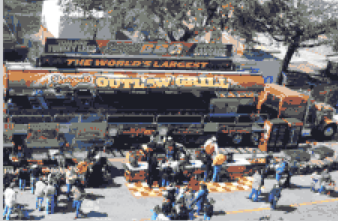 The Outlaw Grill is so popular, it has its own Twitter feed so fans can track its adventures, which range from daredevil stunts over the grill to building the world’s largest burger. Juicys owner Brett Enright was looking for a new POS system to ring sales and provide better oversight into the company’s back office operations. With several Juicys trucks in the fleet on the go constantly, Mr. Enright needed to be able to see comprehensive reports on each truck from anywhere, at anytime. Ease-of-use was also a must: the system also needed to be easy to set up and move. Mr. Enright had already ruled out several options: WiFi systems had proven themselves unreliable and it was difficult to set up a WiFi infrastructure at each stop the trucks made. Mr. Enright selected Revel Systems Bluetooth 3G Mobile application, which includes a 3G Apple® iPad®, Star Micronics TSP650IIBTi printer, and the APG Vasario 1616 cash drawer. The initial install, for the Orange County Fair in California, was for 55 systems. Revel Systems’ iPad mobile POS is a quick, intuitive and secure iOS-based point-of-sale system that combines cloud-base technology and mobility. The feature-rich software includes integrated payroll, inventory tracking, customer relationship management and more. Revel Marketplace allows users to integrate directly into third-party enhancements, such as mobile payments, online ordering, gift or reward cards and advanced financial software suites. Apple MFi certified, Star’s TSP650II BTi receipt printer is approved for use with the iPod Touch®, iPhone® and iPad®. With operating system support for iOS, Android and Windows, the TSP650II BTi features the best of both worlds by coupling the comfort of legacy products with the speed and connection options demanded today in fast-paced mobile point of sale environments. APG Cash Drawer’s Vasario 1616 is a rugged steel design that is competitively priced and tested beyond one million transactions. Features include multi-function lock, drawer status reporting, and manually or electronically operated interface options. It took a day and a half to install all 55 iPad terminals and after a brief training session, Juicys was able to start using the system the following day. Revel’s onsite IT person was available to fix issues as they arose. Although there was a slight hiccup with the system’s “auto connect,” which caused the printers to disconnect, the Revel IT staff was able to fix it quickly so connectivity problems didn’t drastically impact Juicys’ operations. The new system eliminated the reliability problems Juicys was having with other mobile solutions. The cloud-based Revel system allows Mr. Enright to view sales figures from any location in real time with his Smart Phone or laptop. The new solution also helps Juicys employees serve more customers faster, which means shorter lines and less waiting for hungry fair goers. The Revel system is so cost-effective, it took Juicys less than a day to make back their original investment. Star Micronics, one of the world’s largest printer manufacturers, has designed a portfolio of thermal, impact, mobile and multifunction printing solutions utilized in POS, retail, kiosks, restaurants, hospitality and bar code/labeling applications including loyalty programs. Star’s printer models are available with Bluetooth, serial, parallel, USB, PoweredUSB, Ethernet and Wireless LAN interfaces. Please visit www.starmicronics.com to see Star’s complete line of business solutions. Click on these links to read about other point of sale success stories; or find Point of Sale Resources.